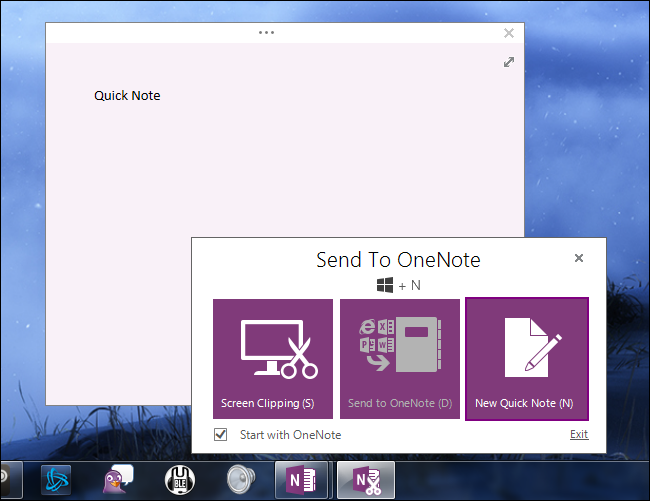 OneNote is Now Free: Is Microsoft’s Note-Taking App Worth Using? Microsoft’s OneNote is now free. 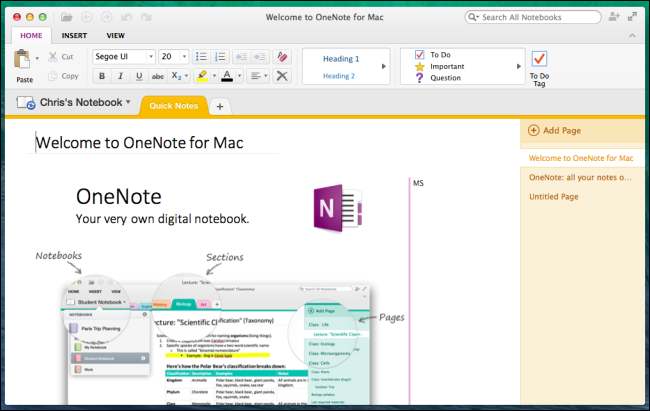 Once a Windows-only note-taking application included with Office, it’s now a free cross-platform note-taking service for Windows, Mac, Android, iOS, and the web. This is Microsoft’s free Evernote competitor. OneNote is a compelling, well-loved application. Now that it’s free and untethered from Windows, it’s a compelling option no matter what platform you use. It’s more feature-filled than Evernote and offers better support for styluses and handwriting. OneNote allows you to create multiple notebooks, with each notebook containing multiple sections, and each section containing multiple pages. These notebooks can be shared with other people, allowing you to collaborate on notes easily. The free version of OneNote stores your notes in Microsoft’s OneDrive, formerly known as SkyDrive. Create some notes on your PC and they’ll also be accessible on your phones, tablets, other computers, and on the web. Far from just writing text notes, OneNote allows you to add to-do lists, images, drawings, files, videos, audio, scanned documents, links, equations, math symbols, and many other things to your documents. If you have a tablet device with a stylus, you can use your stylus to write notes and draw directly in OneNote. OneNote now also offers a OneNote Clipper that works in every major browser. The Clipper allows you to easily clip content from web pages to your notes from your browser. Its interface may seem a bit busy for taking down a note as quickly as possible, which is why there’s a Quick Note shortcut you can use. Just press Windows Key + N on Windows and click New Quick Note or press N again. Type your note into that window that appears and it will be saved to your Quick Notes. You’d probably expect that a Microsoft Office product would be limited to Windows and maybe Mac as well, but that’s not true. Microsoft has built up a whole ecosystem of apps for OneNote, including apps for the Windows desktop, Windows 8, Windows Phone, Mac OS X, Android, iPad, iPhone, and the web. There’s no Chrome app or Linux desktop client, but it will work on Chromebooks and Linux desktops thanks to the web version. RELATED: What’s the Difference Between Office 365 and Office 2016? 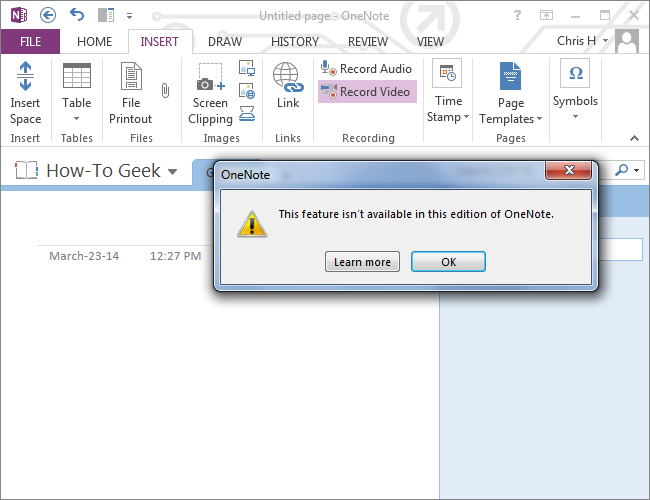 Like Evernote and other services, OneNote isn’t completely free. Microsoft holds back some features to sell their $9.99 per month Office 365 Home Premium service. The paid version of OneNote includes support for local notebooks saved to your hard drive (the free version works with notes stored on your OneDrive account), the ability record video and audio along with your notes, and version history. It can also integrate with Outlook, SharePoint, and OneDrive for Business. Most of the features here are most important for business users. While you can’t create notes stored offline, OneNote will sync notes stored in your OneDrive account so you can keep using it offline. If you’re interested in a note-taking application like OneNote, there’s a good chance you already use Evernote or another note-taking application. 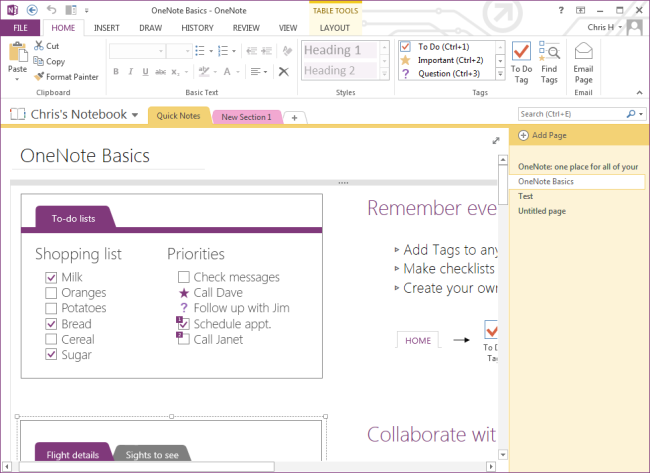 OneNote is a more robust, full-featured application than Evernote. It incorporates features not found in Evernote and allows you to embed many types of multimedia files inline in a note, while such files would have to be attached as file attachments to a note in Evernote. If you plan on writing notes by hand — such as with a stylus on a Windows tablet or iPad — OneNote is definitely the leader in dealing with handwritten input. OneNote’s editing interface is similar to Word’s. Evernote’s editing interface is simpler and more focused on editing text notes. These text notes may also contain images and formatting, but they can’t contain all the types of content a note could in OneNote. Depending on the types of notes you’re creating, you may prefer Evernote’s more minimal text-notes interface to OneNote’s more full-featured interface. OneNote also syncs your notes and changes instantly, while the desktop versions of Evernote will only sync them every 15 minutes. Evernote’s synchronization features have been criticized for being unreliable lately. If you’re interested in OneNote, you should give it a try and see how you like it. You may prefer it to Evernote. OneNote can’t import Evernote notes directly, but there are tools like Evernote2OneNote that will import notes for you. If you want to switch back in the future, OneNote includes the ability to export your notes and Evernote can directly import OneNote files. OneNote is a powerful, solid application. Happy Evernote users may not want to leave their elephant behind and go through a switching process, but anyone who wants a solid, full-featured note-taking application should give OneNote a serious look.